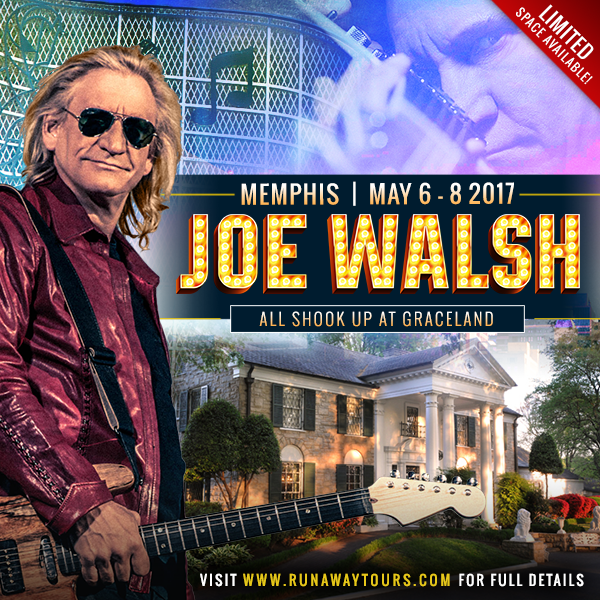 Runaway Tours announces rock icon Joe Walsh as the latest addition to its incredible 2017 calendar of exclusive fan experiences. With a goal to “superserve the superfan,” each Runaway Tours event offers a once-in-a-lifetime vacation package combining intimate concert performances and artist meet and greets with unique destinations. The newest three-day event takes place on Saturday, May 6, Sunday, May 7 and Monday, May 8 at the newly renovated Graceland in Memphis, TN. In addition to a private acoustic storytellers performance, Q&A and special photo opportunity with Joe Walsh, the weekend also includes welcome and after parties, a tour of Elvis Presley’s Graceland and accommodations at the brand-new Guest House at Graceland hotel. The hotel recently opened in October 2016, while a new 200,000-square-foot entertainment complex across the street from the famous Graceland mansion was unveiled in March, offering attendees one of the first chances to enjoy the new attractions. Airfare and transportation are not included in the package. Limited spaces are available. Tickets are on sale now at www.RunawayTours.com/RunawayTours. Runaway Tours is a partnership between the NFL’s On Location Experiences, RedBird Capital Partners and Bruin Sports Capital, with the objective of providing entertainment and sports fans with truly unique destination experiences. Graceland and The Guest House at Graceland are located in the Whitehaven community of Memphis, TN, nine miles from the city’s downtown district and in close proximity to Memphis International Airport. As the former home of Elvis Presley, Graceland is a National Historic Landmark and one of the most visited tourist attractions each year. In early 2017, a new 200,000-square-foot entertainment complex opened on-site with new museums, restaurants and gift shops.